The Manna House is a Christian mission in Northampton, England which operates both a Christian gift and bookshop and a professional Christian counselling service. Keep up to date with news about The Manna House: Bookshop, Counselling Service, manna4theworld and this site. 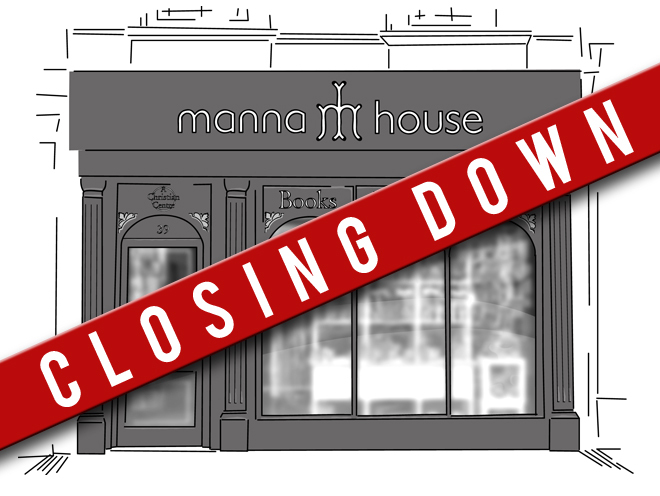 As of Thursday 31st January 2019, The Manna House will be closing its doors for the last time. It’s not a decision that has been taken lightly, but sadly, so many of you are now taking your custom to online giants. Our town of Northampton also suffers from dwindling custom due in part to the new shopping experience of Rushden Lakes, and in part due to closures of some of the most significant big shops like BHS and M&S, not to mention other barriers to town shopping in the form of traffic calming and policing measures implemented over the years. The fact is, not enough of you bring us your custom for this to be a financially viable enterprise any more. And so we also lose a Christian presence on the high street; a key part of the Christian bookshop mission. There are some great outreach projects undertaken by churches from acts of random kindness, through “treasure hunting”, to healing on the streets; even just straight forward evangelism in the form of preaching on the streets. All these are great and if you want to get out there and demonstrate God’s love and deliver His good news, and I would encourage you to get involved or start something at your church. Help fill this gap that we leave behind us. And for those wondering where you can now find your Scriptural greetings cards, “proper” advent calendars, Bibles, Christian Books etc, I cannot stress to you enough the importance of finding another Christian Bookshop and giving them your custom. If your closest is too far away, call them; find out if you can have them post to you what you are looking for. It is so important to support these missions where you find them. Not only do they supply your needs, in your own walk in faith, they are often an approachable Christian presence for those ill-at-ease with the idea of going to a church. They can signpost to other missional work and to churches and might be the place where the unchurched can easily be offered prayer. And wherever possible, shop locally. It’s not only Christian retailers who are finding this changing commercial environment difficult to traverse, small independent retailers need your support too. I know how easy it is to add-to-cart and be done with it, but for a little extra effort and occasionally a little higher cost, you can make all the difference for small businesses and those whose jobs rely upon them. However, as this 35 year old oak tree loses it’s last leaf, an acorn has also sprouted. Look out for news of Heyford Books - a new bookshop in Nether Heyford at the Jesus Fellowships New Creation Farm, run by our own Martin Brown and Tony Solomon of manna4theworld. We’ll bring you more news as we receive it. for their support over the years. Counselling Services in the County of Northamptonshire. to be transferred to support the Manna House Counselling Service. be managed and run by Martin Brown and Tony Solomon.